Read up on our most recent article about the store! We are turning 81 this year! 80+ years operating in the organic and natural foods sector since 1936. A family run business in its 5th generation. Thank you to our loyal customers, to our community and friends! KALAMAZOO, MI – Sawall Health Foods on Wednesday held a grand opening for its newest addition, Amorino Gelato. It's just one part of a wider expansion to the store, the eighth since Sawall was established in 1936. Owner Mark Sawall and his wife, Daniela first tried Amorino Gelato in Paris, where the gelato is produced, then decided they had to have it for their store in Kalamazoo. They chose Amorino because its products don't have additives or dyes in them and use all-natural ingredients. "It's unlike anything else that anyone's tried here," Mark Sawall said. While the Amorino Gelato storefront inside Sawall Health Foods is the only one in Michigan, it is also the only location inside of another business. With other stand-alone Amorino storefronts in larger cities like Chicago, New York and Las Vegas, Kalamazoo was a "hard sell" for the Amorino company, Sawall said. He pitched his family business to the company and said having Daniela, who was raised in Italy, speak to them didn't hurt either. Mark Sawall trained at an Amorino location in New York City and the company sent someone to help them open up the gelato business in Kalamazoo. Martino Bedont will be here helping the Sawalls for a month before returning to Italy. The Sawall Health Foods location offers 16 different flavors, which can be served in a cup or as Amorino's signature gelato rose -- your choice of gelato or sorbet shaped as a rose in a cone. They also offer items like sorbet drinks and gelato macarons. Prices range from $5.05 for the smallest size to $12.85 for the largest. There's also a child-sized portion for $3.25. Amorino is only one part of an expansion on the 80th anniversary of Sawall Health Foods, which the owners say is the oldest family-owned and family-operated natural health foods store in the United States. The business also plans to serve traditional Italian foods like pizzas cooked in a wood-burning oven, paninis and an antipasto bar. There will be gluten free and vegan options, and Sawall purchased a separate pizza oven and panini maker to accommodate customers with food allergies. A dining area and craft beer and wine bar are being built as part of an upstairs addition. The Sawalls hope to have all of the work done by the end of August. Sawall Health Foods is located in the Oakwood Plaza at 2965 Oakland Drive, Kalamazoo. Industry pioneers Sawall Health Foods, Nature's Path Organic, Presence Marketing and Nordic Naturals, share how they have not only survived but thrived as the industry has changed. When Frank Sawall opened his 800-square-foot health food store in downtown Detroit in 1936, the nation was in the throes of the Great Depression. Unemployment was 17 percent, and grocers were responding by stocking shelves with cheap, ultra-processed offerings like Spam, Jell-O, Kraft Macaroni and Cheese, and Oscar Mayer wieners. Sawall, a biochemist who had crafted and sold powdered nutritional supplements door-to-door, saw this as a worrisome trend that he wanted to head off. Today, the industry the Sawalls helped spawn is characterized more by competition and consolidation than counterculture. Conventional food giants are gobbling up legacy organic and natural brands, and big-box stores and grocery chains are squeezing out independent retailers in pursuit of the coveted $120 billion natural products pie. But amid all this change, a few industry pioneers have managed to not only survive but thrive while remaining family owned. This year, Sawall Health Foods—the nation’s oldest health food store—celebrates its 80th anniversary, Nature’s Path Organic turns 30, Presence Marketing turns 25 and fish oil maker Nordic Naturals marks its 20th birthday. How did these legacy companies stand the test of time and what lessons can they share with newcomers? Here’s a look. Sawall Health Foods is Expanding! Click on the image below for the MLive report of April 30th, 2015. Mark Sawall is in the fourth generation of his family to work in Sawall Heath Foods, founded by his great grandfather, Frank August Sawall. Sawall Health Foods has just added a full kitchen to prepare a wide variety of fresh foods for its deli offerings. .
KALAMAZOO — Although Sawall Health Foods got its start selling vitamins and health supplements, some still assume that the vitamins are all the store carries. Not so. These days you can spend some significant time shopping for everything from soup to nuts and cheese to wine. The cheese comes from local dairies. The wine is organic and sold in the $5 to $15 range. After seven expansions since 1990 at its current site, 2965 Oakland Drive, vitamins and health supplements now account for 10 percent of sales. Walk into Sawall and you’ll find the grocery store of the future. Everywhere you turn, there’s something good for you. 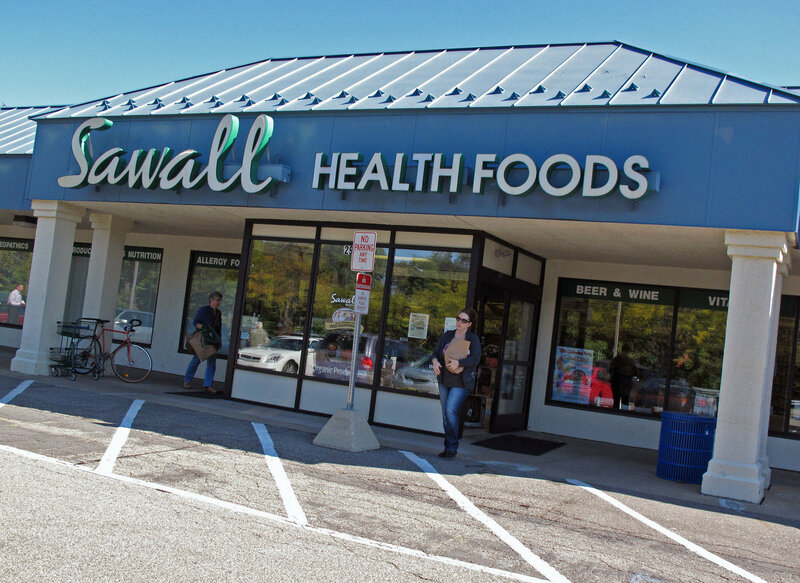 Sawall Health Foods will celebrate its 75th anniversary from 11 a.m. to 4 p.m. Saturday at the store, 2965 Oakland Drive. Festivities will include food tasting featuring 17 vendors, as well as hot dogs, brats and veggie hot dogs for sale, discounts on products, live piano music and drawings for gift baskets and a shopping cart full of food. The store has just finished installing a commercial kitchen. Hot food will soon be ready for take-out. Four-pound organic rotisserie chickens are already available. “We’re getting ready to outgrow our parking lot,” said director of operations Mark Sawall, who is also a member of the Sawall board of directors. 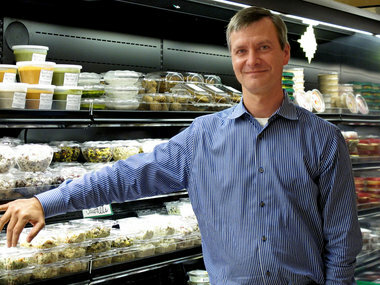 After seven expansions, Sawall Health Foods offers a wide variety of items in a supermarket-sized store in Kalamazoo's Oakwood Plaza. A family concerned about health and the environment can now do complete shopping at Sawall and purchase organic meat, produce and bread and all-natural cleaning supplies. Pet food mirrors the quality of food for the pet owners who shop at Sawall. 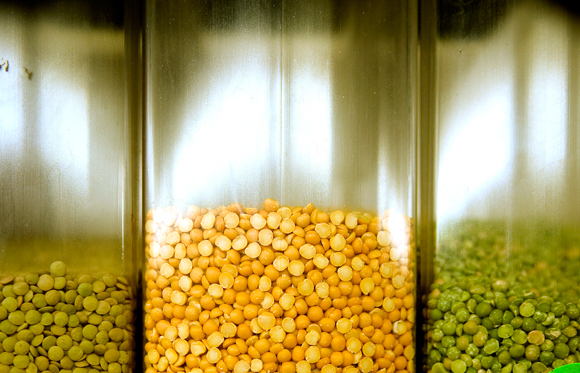 The variety at Sawall comes from the way Sawall orders products. He has looked for products that help people with limited diets. In the process, he has created an inventory that everyone can embrace. For those who are lactose intolerant, for instance, at Sawall, buyers have a choice of soy milk, hemp milk, almond milk, sunflower milk, rice milk and coconut milk. “The majority of our customers come and say, ‘I can’t eat wheat,’ or ‘I can’t eat dairy,’” he said. “We go all over the country to find products for people with chemical allergies. “This is a business that is easy to like. You’re constantly helping people. We show people who have restricted diets that they still have a life and can cook for their families and eat with their families, too,” Sawall said. Sawall Health Foods plans to celebrate its 75th anniversary with an Oct. 8 party at its Oakwood Plaza location. The roots of the family business go deep. Frank Sawall, the great-grandfather of Mark, began by selling mineral supplements in powder form door-to-door in the early 1930s. He opened the first store in 1936 in Detroit. He got the idea of selling mineral supplements after attending health symposiums offered by the Kellogg Co., in Battle Creek. He later established another store in Detroit and then stores in Lansing, Bay City, Grand Rapids and Kalamazoo. The Kalamazoo store was the last to open in 1950. The other stores failed, but the Kalamazoo store has remained in business since its inception. It was established at 305 E. Vine St. (now a Bronson Methodist Hospital parking structure), and was moved to its current location in 1990. Robert and Linda Sawall, the parents of Mark Sawall, own the store. Mark Sawall, 43, has worked at the store since he was 9. Noreen Sawall, wife of Mark Sawall’s brother Rob, has worked for the store for 18 years. Linda Sawall said she knows customers who have shopped at the store since it opened in 1950. Contact William R. Wood at bwood@kalamazoogazette.com or 269-388-8549. There are trend setters and then there are those who are way ahead of the curve. Sawall Health Foods is definitely one of the latter. This year it's celebrating its 75th year in business, and the natural foods store has never been more on top of its game. It all started with a bit of mineral powder and a passion for good health. Frank Sawall opened the first Sawall natural foods store in 1936, but he had been selling mineral supplements in powder form before then, going door to door. Sawall had developed an interest in good health that had only intensified as he attended health symposiums offered by the Kellogg Company of Battle Creek. He had noticed that vitamins and minerals could be difficult to absorb for some, and he created a powdered version to solve the problem--and his products became quickly popular. "His first store was in Detroit," says Linda Sawall, third-generation owner of today's Sawall Health Foods, along with her husband, Bob, who is Frank's grandson. "He expanded hours and inventory as interest grew. There were soon two stores in Detroit, others in Bay City, Lansing, and Grand Rapids. The last store to open was in Kalamazoo in 1950." Last but far from least. The Kalamazoo location (at 2965 Oakland Drive) is the only Sawall store open today. 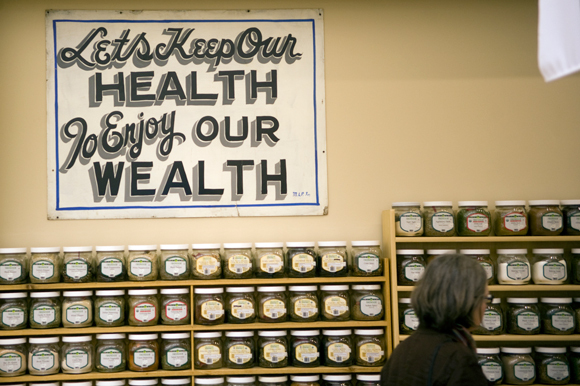 After six expansions, it is Kalamazoo's most popular health food store, repeatedly winning the Kalamazoo Readers' Choice award by popular vote. Sawall Health Foods is the oldest family-owned natural foods store in Michigan and one of the oldest in the country. A large selection of natural foods, organic produce, bulk items and spices, gluten-free foods, vitamins and supplements, natural cosmetics, and organic wines and micro-brewed beers fill more than 20,000 square feet of aisle after aisle. "Frank Sawall went from store to store, giving lectures on diet and good health," Linda Sawall says. "He was very knowledgeable about health, and he could just look at you and tell you what you were missing in your diet," she says. When Frank Sawall passed away at age 86, his son Gordon took over the business--until 1979 when Bob and Linda Sawall bought the Kalamazoo location. By then, she says, it made sense to focus on one location, and one by one, the other locations closed, even while the Kalamazoo store grew. The original location was on Portage Street, then on Vine Street. "We've been on Oakland Drive about 20 years now," Linda Sawall says, "and we are here to stay." Linda and Bob Sawall live very close to the store, so it is convenient for Linda to come in most every day of the 365 that the store is open. She is a frequent presence in the store aisles, appearing almost magically whenever a customer has a question or is puzzling over which product to choose. "I'd rather not go on vacation," she says. She proudly counts 31 years of working at the store while her husband worked at State Farm until his retirement in 2000. Their two sons, Mark and Rob, have worked at Sawall Health Foods to earn their way through college. Mark continues to work at the store, while Rob works as a teacher in Grand Rapids--but Rob's wife Noreen continues to work at the store. 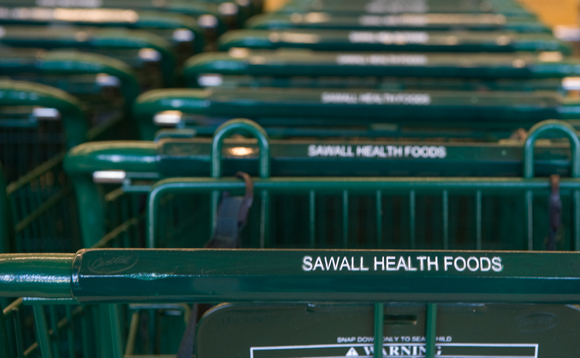 Sawall Health Foods has always worked with local businesses, encouraging local connections long before the movement to buy local had become popular. Local entrepreneurs are welcome to come in and talk to the Sawalls about their products, but the products must be certified organic. "If we say it's organic, it must be organic," Linda insists. "Just because it's local doesn't mean it's good or that it is clean of pesticides. California started the organic movement because they have such a long growing season, but in Michigan we have a much shorter season." Because of that shorter season, she says, some Michigan foods may actually be grown using heavier doses of pesticides and non-organic fertilizers to shorten the time from field to store shelf. 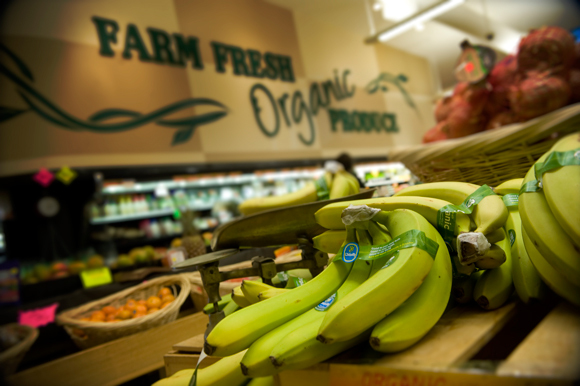 Produce on the Sawall shelf must meet strict criteria for highest quality available, organically grown. Michigan-grown or produced products on store shelves include Victorian Bakery, Kurry Guru, soaps from Traverse City, Kalamazoo Coffee Company, Zingerman's, The Adventures of Barb and Tammy, Lush Nuts, Little Store on the Prairie, Old Pan Toffee, and many, many more. Special orders, customized to the customer's needs, are also encouraged. "While we have a huge selection, we can't stock everything," Linda says. "We get special requests every day, and we are happy to fill them. Sometimes people move here from somewhere else and want something they miss from back home. We can usually get that for them." 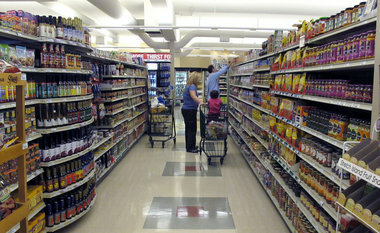 What Linda most enjoys, however, is walking through the aisles helping customers make informed choices. She is one of about 30 employees working at the store, many of whom are students from higher education institutions nearby. "People working here are more geared to helping people," Linda says, considering the differences a customer might encounter at Sawall Health Foods that they might not get at chain grocery stores. Education, she says, is a big part of learning how to eat a healthier diet. With a nod toward Sawall roots, one of the largest selections in the store is still to be found in the vitamin and supplement aisles. 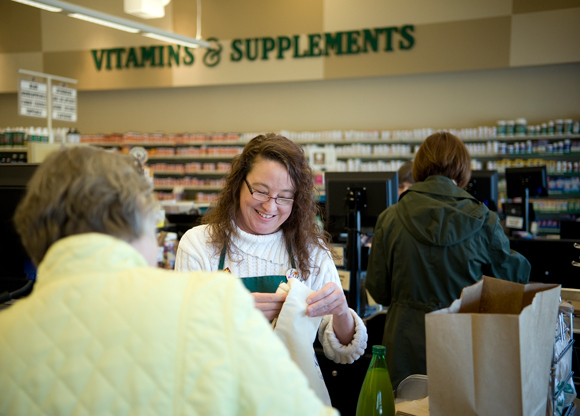 Employees are happy to answer questions about which vitamin, which supplement might be best for one's needs. Information is also abundant on the store website. As for the occasional comment about higher pricing for organic produce, Linda Sawall points out that good health is priceless. The store offers student discounts along with senior discounts. "We always have store specials going on," she says. Discounted items can be found on the end of most any aisle. And, because of the volume the store has on the shelves, Sawall can offer the best price available. "When we can find a discount, we pass it along to our customers," she says.